The book she stumbled across in 1990 was a recently published softcover volume that could easily get lost in the stack of books in the Davis Library at the University of North Carolina. In fact, the chance find of this book in the library would change her destiny. At the time Monika Ardelt was a Teaching Fellow in the Department of Sociology at UNC in Chapel Hill and a student undertaking a Ph.D in sociology. The book that caught her attention was called “Wisdom: Its nature, origins, and development”, edited by Robert J. Sternberg, the IBM Professor of Psychology and Education at Yale University. The book was unique in that, for the first time, it was reporting the findings of a number of psychologists who were exploring wisdom – a subject that, until recently, had been solely in the domain of philosophers and theologians for numerous centuries. What struck Ardelt upon reading the book was the lack of a unified definition of wisdom. The thirteen researchers produced thirteen different definitions of wisdom. She also observed the number of references to studies undertaken in the 1970s by two psychologists, Vivian Clayton and James Birren. One of the reasons psychologists had ignored wisdom was the belief that is was an elusive construct and there was no value in exploring it. Clayton and Birren changed this thinking by suggesting the wisdom involved three dimensions that psychologists already were familiar with: the cognitive, reflective, and affective dimensions. Since then she has continued to build on Clayton and Birren’s work and is now recognised as one of the world’s leading wisdom researchers. How might these three dimensions map into the Can-Do Wisdom Framework? The first point that Ardelt makes is that wisdom is an individual’s construct and therefore belongs in the I Can and I Do quadrants. While your fundamental assumptions and core beliefs form the foundation of your mindset, mindset actually includes your thoughts and attitudes, as well as your values, choices, and desires. Your needs, wants, hopes, and concerns are all a part of your mindset, as are your fears, worries, fantasies, and illusions. The focus of the rational view is the objective measurement of the external reality. And through its use we have seen great advances during the industrial age including transportation, communications, medical advances, and so on. The scientific method works by dissecting reality into smaller and smaller pieces. It operates on a machine metaphor. As Meg Wheatley writes, “A world based on machine images is a world described by boundaries. In a machine, every piece knows its place. Today, there are specialists who have great knowledge and understanding of their piece of reality – their piece of the machine – but without understanding the whole. The rational mindset is also based on the now with little regard to the lessons of history and to the consequences for future generations. It focusses on individualism rather than the collective. In the 20th Century the new ideas of quantum physics did not replace the Newtonian physics from the 17th Century. In the same way, the rational mindset is not obsolete but, on its own, it is often misused and is also inadequate to deal with the complex, inequitable, fast-moving reality we find ourselves in today. We need to develop a relational mindset as well and be able to choose when to use one or both mindsets in solving problems. The I Can mindset is that of a relational view, while the mindset of the rational view is that of a machine metaphor. With that background on mindsets, we can look into mapping Ardelt’s cognitive, reflective and affective dimensions into the Can-Do Wisdom Framework. These three dimensions interact with each other so that it doesn’t really matter which one comes first. This aspect of wisdom is measured by the Reflective dimension. Ardelt explains the reflective dimension is assessed, firstly, by the ability and willingness of a person to look at events and phenomena from different perspectives. By doing so it means there is not a fixed mindset and so avoids the chance of prejudging an event. Secondly, it includes looking at oneself objectively rather than subjectively and taking responsibility instead of blaming others. It comes down to being self-aware rather than self-centred. Ardelt has observed low wisdom scores for ego-centered individuals. It requires experience of life events but experience on its own is not enough. It is reflecting and learning from experiences that make you wise. These experiences can be positive or negative. Meditation is also important as Ardelt has found that those who had more experience in meditation tended to have higher wisdom scores. This aspect of wisdom is measured by the Cognitive dimension. Here the assessment looks at the ability and willingness of a person to understand a situation or phenomenon thoroughly by comprehending the significance and deeper meaning of intrapersonal and interpersonal matters. To understand these deeper meaning requires reflection, which means the cognitive dimension relies on the other two dimensions to develop wisdom. Each dimension reinforces the other dimensions. This aspect of wisdom is measured by the Affective dimension. Ardelt now calls this the compassionate wisdom dimension, which she describes as a combination of the reduction of excessive self-centeredness and a sympathy or tolerance or compassion towards others. It includes empathy – putting yourself in another’s shoes – but compassion goes further in doing something about the situation. Neuroscientist Dilip Jeste suggests wisdom involves keeping the balance between selfish and pro-social (empathic and compassionate) behaviour. It is measured by looking for the presence of positive emotions and our behaviour toward others and the absence of negative emotions and behaviour toward others. 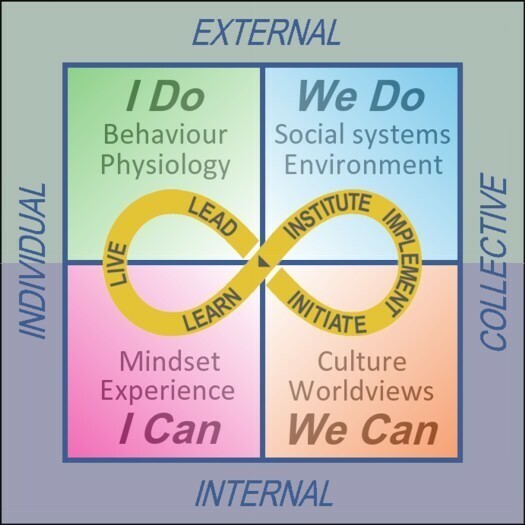 It is our behaviour in the I Do quadrant that is visible to others in the external world. Again, reflection is important in developing the compassionate dimension as it helps us to see ourselves as we truly are. What is your wisdom score? The Three-Dimensional Wisdom Scale (3D-WS) is now widely used for measuring wisdom. In 2007 The New York Times featured an extensive article on the developments in wisdom research and included a link to the Ardelt’s Wisdom Scorecard. The questionnaire contains 39 statements in three dimensions – cognitive, reflective and affective. Press the begin button to answer the questionnaire. Once you have completed all of the questions, you can see your wisdom score by pressing the results button. There are no easy shortcuts for the development of wisdom. However, the following exercises in mindfulness might help you to learn from your experiences and, therefore, promote the acquisition of wisdom. 1. Observe Everything: Look out your window or sit in your own backyard. Close your eyes and take a couple of conscious breaths. Open your eyes and for approximately 15 minutes try to observe everything! Do not talk to anyone during that time. Observe everything in your surroundings. Repeat this exercise in different environments. 2. Be Mindful: Practice ‘‘mindful presence’’ and ‘‘mindful listening’’ when talking with someone. Try to listen completely to the other person. Don’t interrupt the person who is talking, don’t try to tell your own story, and don’t think ‘‘ahead’’ while the other person is talking. Practice mindful listening and being fully present in the moment. 3. Move Toward Meditation: Practice spending some time with yourself (rather than just by yourself). Be mindfully aware of everything you do. For example, be aware that you are walking, that you stop walking, that you are sitting down. Close your eyes and feel yourself breathing and sitting. Observe the thoughts that come into your head. Don’t follow or indulge in the thoughts, just realize the thoughts that are there. Try to feel your body. After about 15 minutes, open your eyes and realize how you feel. Don’t judge yourself. Just realize whether you feel calm, nervous, agitated, peaceful, angry, loving, and so on. To really make progress on the path to wisdom, participate in a meditation retreat. Information on many meditation courses and retreats can be found on the Internet. For information on an ancient mindfulness mediation technique that traces its roots to the teachings of the Buddha, see http://www.dhamma.org. In this interview Professor Adrelt talks about her research interests, the development of wisdom in individuals, its benefit for wellbeing and the importance of applying wisdom in business. 1. Robert J. Sternberg, Wisdom: Its nature, origins, and development (NewYork: Cambridge University Press, 1990). 2. Charles Cassidy, “Wisdom Profiles: Monika Ardelt,” (blog), posted May 14, 2016, https://evidencebasedwisdom.com/2016/05/14/wisdom-profiles-monika-ardelt/. 3. 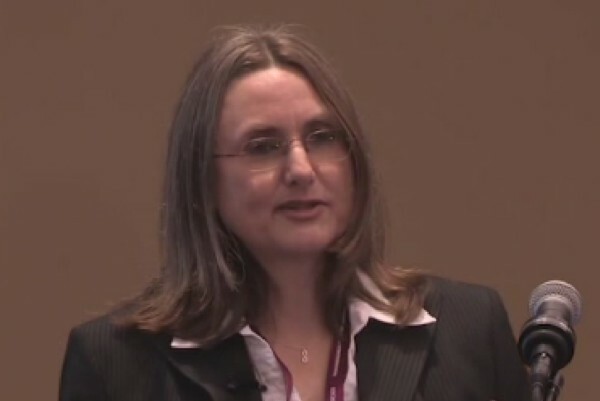 Wisdom Research at the University of Chicago, Conversations on Wisdom: UnCut Interview with Monika Ardelt, https://www.youtube.com/watch?v=VGGbmD0hauY. 5. Monika Ardelt, “Empirical Assessment of a Three-Dimensional Wisdom Scale,” Research on Aging 25 (2003): 275-324., http://users.clas.ufl.edu/ardelt/empirical%20assessment%20of%20the%203d-ws.pdf. 6. Dean Anderson and Linda S. Anderson, Beyond Change Management: Advanced Strategies for Today’s Transformational Leaders (Jossey-Bass/Pfeiffer, San Francisco), 80. 7. Anderson, Beyond Change Management, 30. 8. Anderson, Beyond Change Management, 112. 9. Monika Ardelt, “Wisdom as Expert Knowledge System: A Critical review of a Contemporary Operationalization of an Ancient Concept,” Human Development 47 (2004): 257–285, http://users.clas.ufl.edu/ardelt/Wisdom%20as%20expert%20knowledge%20system.pdf. 10. Dilip Jeste, Seeking wisdom in graying matter, https://www.youtube.com/watch?v=pKaLWePrhhg. 12. Monika Ardelt, “Being wise at any age,” in Positive psychology: Exploring the best in people. Volume 1: Discovering human strengths, ed. Shane J. Lopez (Westport, CT: Praeger, 2008). http://users.clas.ufl.edu/ardelt/Being_wise_at_any_age.pdf. Posted in can-do wisdom, Wisdom and tagged how to develop wisdom, measure wisdom, Monika Ardelt. Hi Adrian. I see you have been busy with some more interesting essays on wisdom. I enjoyed reading about the backstory of Monoka Ardelt and the development of the methodology to measure or gauge one’s progress in the qualities of being wise. Hi Geoff. Thanks for the comments. Keep tuned for more stories. Where can the wisdom test be obtained, the link in the webpages just go to the New York Times. Hi Louis – this link works on a PC using Microsoft Edge or Google Chrome browser: https://archive.nytimes.com/www.nytimes.com/ref/magazine/20070430_WISDOM.html?